Tattoos are a part of mainstream culture. 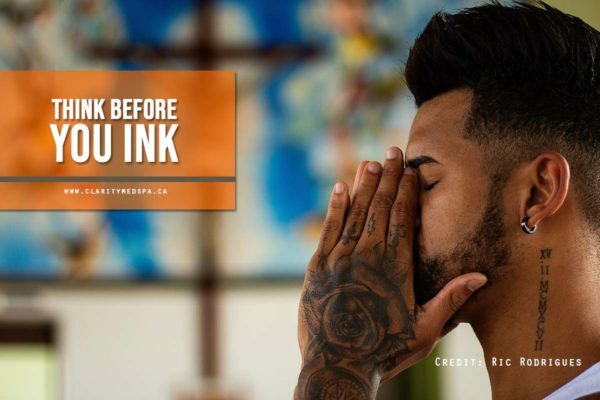 However, many people rush into the decision to get “inked” before carefully considering the image, message they’re sending, and its permanence. Acquiring a tattoo should be preceded by a great deal of thought and consideration. The same amount of caution applies to tattoo removal. The rising popularity of tattoos has been complemented by advances in tattoo removal technology. Lasers are medically approved for the procedure (as well as other treatments including hair removal and skin resurfacing). Over the years, tattoo removal with laser technology has become more widely available, effective, and affordable. A change of heart – While having someone’s name placed permanently on your body may once have seemed like a wonderful “gift” for a boyfriend or family member, relationships change. Also, a hasty decision about an image or failure to properly research a message in a foreign language may be disappointing later. Also, after some years, a tattoo can lose its meaning and no longer reflect the ideals of the individual wearing it. Alternately, it may have been acquired while “under the influence” or because of peer pressure, and the patient wants to have it removed as soon as possible. Poor quality tattoo – Not all artists are capable of creating beautiful artwork on skin. Whatever the reason, if the work was substandard its wearer likely wants it removed. Plans for alterations to the art – If a person plans to get a cover-up of previous artwork or have their tattoo altered, getting rid of some “old ink” may be advised. This can make the re-ink process easier and produce better results. Career change – Sometimes a new job may require tattoos on exposed skin (e.g. the fingers, knuckles, wrists, neck, and ankles) to be removed. Although dress codes and rules have changed slightly in the corporate world, in many industries tattoos are frowned upon (and in some cases, prohibited). Number of Sessions – Laser tattoo removal takes time. The number of sessions varies. It depends on age of the tattoo, ink colour, ink density, and tattoo location. A few clinicians can offer great results in four to five sessions. However, most treatments may take as many as 10 to 15 sessions with several week breaks in-between appointments. Age – Wait at least one year after getting a tattoo to have it removed. If your ink is less than a year old, it has not fully set. Treating it prematurely may have poor results. 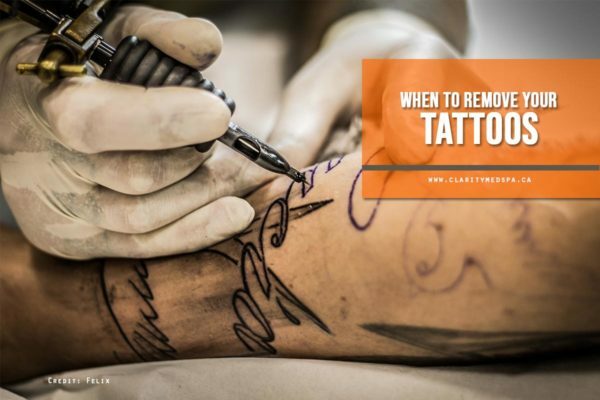 Removing older tattoos is often less difficult and requires fewer sessions. Ink Colour and Density – Certain colours can be more challenging to remove than others. Black is the easiest colour to treat with laser tattoo removal. Coloured tattoos (specifically those containing red, pink, light green, light blue, and turquoise) are more difficult to eliminate. Bolder, denser lines also prove to be more resistant to lasers than shading. Tattoo Location – The laser breaks ink down into tiny particles to be flushed out of the body by white blood cells. Because of this, tattoos closer to the heart (e.g. on the chest) tend to diminish more quickly. Tattoos on appendages (toes, fingers, and arms) often will require more treatment sessions. Price – When searching for an establishment offering tattoo removal, price should not be the foremost on your checklist. Do research to choose an insured, reputable clinic that has appropriate, sterilized equipment (and well-maintained lasers), and trained technicians. A bad tattoo removal can look worse than the tattoo you wanted erased. 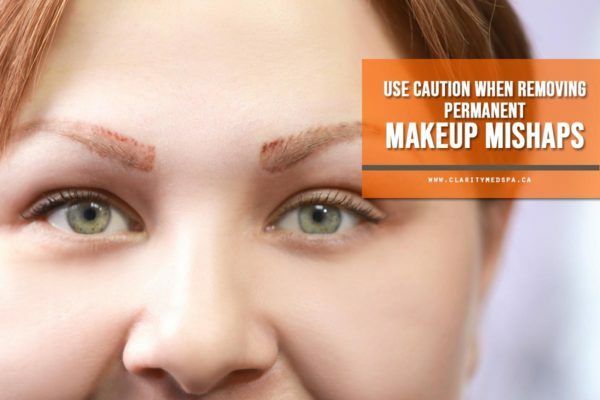 Permanent Makeup – Permanent makeup is a kind of tattoo. It is often applied to eyebrows, eyelids, cheeks, and lips. Because it deals with the sensitive tissues of the face, removing permanent makeup must be done with care and precision. Consult a professional with a proven track record in dealing with tattoo removal, specifically for procedures involving this sensitive area. Medical History – When you go in for your first consultation or treatment, be certain to share relevant medical history with your specialist. Inform them if you are pregnant or have certain conditions (e.g. hypersensitivity, autoimmune disease, lupus, or type 1 diabetes). These factors influence your treatment plan. The Q-switched ruby and alexandrite lasers are useful for removing black, blue, and green pigments. Darker skin types benefit from the safer approach using the 1064nm Nd:YAG laser. Depending on the number of colours in a tattoo, more than one laser may be used for removal. Other factors that need to be carefully considered are spot size, fluence, and pulse duration. When getting a tattoo, it’s important to choose a qualified artist. Otherwise, there is risk of infection or a substandard tattoo. It is the same when choosing a clinician to handle your tattoo removal treatments. Do your research, and get safe, positive results. Inferior tattoo removal can cause skin problems and look worse than the original ink to be removed. Ask for references – One of the most reliable ways to find a trusted service provider is through word of mouth. If you know anyone (friends or family) who has had a tattoo removed, talk to them. Ask about their experience, the cost, and the efficacy of the procedure. Read online reviews – If you don’t know anyone who’s had a tattoo removal, take your search online. Find local providers and visit their website, social media pages, or a third party site (like HomeStars or Yelp) to look at their ratings and reviews. Schedule a consultation – Call a licensed laser clinic that offers tattoo removal and book a consultation. Some offer this service for free. Ask questions about their experience, training, equipment maintenance, and insurance. Look at the facility. Is it clean? Do you feel comfortable or does it seem like a basement or “back room?” Walk away if the environment isn’t right for you. If you have a tattoo you need removed, seek the best care and do not let cost influence your decision. Your skin needs to be protected and your health is paramount. You want a provider who can deal with any potential medical complications of tattoo removal. For laser tattoo removal treatment in Toronto, contact Clarity Medspa & Laser at (416) 960-2222. Meet the experienced, trained staff you need for this (sometimes lengthy) procedure. Visit our medical-grade facility and see firsthand the warm, safe environment we provide. Consult with us today about your options.